ISIM presents a thrilling performance at Roulette: the culmination of the three-day ISIM workshops, discussions, and jam sessions held at at York College, June 29 – July 1. Featuring guest artists, Gamin, Hyun-Sik Shin, Jane Ira Bloom and Elliott Sharp, and joined by the ISIM ensemble, the ISIM Performance explores and showcases the wide-open possibilities of crosscultural dialogue through improvisation and collective expression. 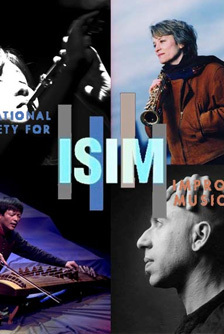 The International Society for Improvised Music (ISIM) promotes performance, education, and research in improvised music, and illuminates the connections between musical improvisation and creativity across fields. Melding diverse cultures, ethnicities, disciplines, and ideas that shape society at large, today’s musical world is increasingly characterized by creative expressions that transcend conventional style categories. Improvisation is a core aspect of this global confluence of this eclectic musical activity. ISIM brings together artists, listeners, teachers, industry professionals, and researchers, to further the growth and understanding of improvisation in our educational systems and society at large. Having hosted six festival/conferences since 2006 in Ann Arbor, Chicago, Denver, Santa Cruz, and Wayne NJ, ISIM has provided a robust forum for a wide range of artists, teachers, and thinkers tocome together and engage in a wide range of collaborations. as to interact with top-level musicians from highly varied backgrounds. In 2014, ISIM will continue the crosscultural improvisation, but within the more expanded ISIM festival/conference format that also features papers, panel discussions, and a broader array of daytime and evening performances. Gamin is one of the most celebrated gukak artists in her generation. She is a versatile musician that she plays piri, taepyeongso (Korean traditional oboe family) and saengwhang (ancient wind-blow instrument). From a young age, she began training in music and studied with Jung Jae-Guk, the title holder of the Important Intangible Cultural Asset No, 46 for piri and daechwita. From 2000 to 2010, Gamin was a member and assistant principal player of the Contemporary Gukak Orchestra at the National Gukak Center, the hub for training and preserving Korean traditional music. She has toured internationally and a recipient of several cultural exchange programs including Arts Council Korea and Asian Cultural Council. Hyung-Sik Shin is considered the best ajaeng player in Korea. He has won the top prizes at the traditional music competitions and performed outstanding improvisational Korean music not only in Korea, but also on global stages. He was chosen as one of the “10 future leaders for next generation” by The Auditorium: Music & Performing Arts Journal. Currently, Shin is a leader of Korean traditional improvisation ensemble, Ensemble Sinawi. He is also an Instructor of Korean traditional department at Korean National University of Arts. Shin has received Best prize of Honam Arts Festival, Gwang Ju National Traditional Music Competition, Daegu National Traditional Music Competition, Jeon Ju Daesaseup play, prize of 21 C. Korean Music project and KBS Grand prize of Korean traditional music. Jane Ira Bloom is a soprano saxophonist/composer and Guggenheim Fellow in Music Composition. Bloom is recognized as a pioneer in the use of live electronics and movement in jazz. She is the winner of the Mary Lou Williams Women In Jazz Award, the Jazz Journalists & Downbeat Critics Poll Award for soprano saxophone, and the Charlie Parker Fellowship for Jazz Innovation. Bloom was the first musician commissioned by the NASA Art Program and has an asteroid named in her honor by the International Astronomical Union (asteroid 6083janeirabloom). Bloom is a professor of jazz and contemporary music at of the New School for Jazz & Contemporary Music in NYC. Elliott Sharp is a composer, double-neck guitar performer, and producer central to the NYC new music scene. He leads Orchestra Carbon, Tectonics, and Terraplane and has pioneered ways of applying fractal geometry, chaos theory, and genetic metaphors to musical composition. Sharp’s Oneirika was premiered in 2012 at MaerzMusik, Berlin. He was commissioned by Issue Project Room to create Occam’s Razor for double string-quartet for his 60th birthday marathon and by violin virtuoso Hilary Hahn to compose Storm Of the Eye for her Encores project. He also directed, wrote, and composed About Us, a sci-fi opera for all-teenage performers at the Bayerische Staatsoper. He has been featured at Donaueschingen and Darmstadt festivals and the Venice Biennale in 2003, 2006 and 2012. Sharp’s work is the subject of the documentary Doing The Don’t. The program is made possible with support from Arts Council Korea and York College/CUNY.